In May 2011, Barry Dalal-Clayton undertook a scoping visit, to work with the School of Environmental Science and Management (SchEMS) – an affiliate of Pokhara University and the newly-formed Asian Centre for Environmental Management and Sustainable Development (AEMS) (www.aemsregional.org). The focus was to assess interest in Nepal to adopt and pilot the use of on strategic environmental assessment (SEA) and to facilitate an SEA awareness-raising workshop. This led to the National Trust for Nature Conservation (NTNC) inviting IIED to help it plan for an SEA of the Annapurna Conservation Area (ACA) – more details below. An awareness-raising and planning workshop for staff of the NTNC and Annapurna Conservation Area Project (ACAP) was subsequently organized in Pokhara on 17-19 October 2011, attended by some 30 participants. The workshop had two key focuses: a generic introduction to the nature, role and modalities of SEA; and to scope out an approach to undertaking an SEA of the ACA. ACAP is a project of the NTNC and has been operating for 25 years under a mandate from government to NTNC to manage the ACA. The mandate expires in 2012. The SEA will assess the environmental, social and economic impacts of ACAP in an integrated ways to help identify ACAP activities which are beneficial and should continue, those which might need to change or redesigned, gaps requiring attention, and new issues and challenges such as climate change. The SEA will contribute to developing a strategy for a new phase of ACAP. However, agreement has been reached with the Department of National Parks and Wildlife Conservation, that the planned SEA work in the ACA will be a component of a wider SEA which will aim to inform the development of a new policy for protected area management. Thus the SEA component focusing on the ACA will be undertaken as a pilot to develop an SEA approach tailored to Nepali needs, and to build capacity and awareness. As such there will be a significant training component. Subsequent components will focus on other protected areas in the Himalayas: Sagamartha National Park (managed by government), and Kanchenjunga Conservation Area (now managed by a community organization); and a comparative component in the terai region (Chitwan National Park – also managed by government). The SEA will also look at protected area management issues at a national scale. A concept note for this work is being developed to assist in raising the required funding. NTNC, AEMS and IIED hope to undertake this work in 2012-2013. The scoping visit in May 2011 also identified strong potential to address broader issues of environmental mainstreaming. As a result, IIED collaborated with the University of Pokhara and AEMS to initiate a Learning and Leadership Group process. A national Steering Committee was established, chaired by the Ministry of Local Development. Other members include the National Planning Commission, Ministry of Environment, UNDP/UNEP Poverty-Environment Initiative (PEI-Nepal), University of Pokhara, AEMS and IIED. The Steering Committee invited 15 eminent environmental experts and champions to form the core of an Environmental Mainstreaming Learning and Leadership Group (ELLG), and started planning for a national retreat workshop on EM for the ELLG. In preparation for the workshop, the University of Pokhara and AEMS (under the leadership of Professor Ram Khadka) developed a background paper on past experience concerning EM in Nepal, and, in parallel, undertook a detailed assessment of Nepal’s experience and practice in environmental mainstreaming, using the draft EM diagnostic developed by IIED. Where appropriate and possible, exchange of personnel for study, project activities, and capacity development. In Asian countries, the concepts of environmental mainstreaming and green economy are still relatively new. In the region, many professionals that are concerned with these issues are limited in number and work in isolation, and they have limited means to share their experience and perspectives and to work together to identify good practice and effective approaches to progress. On 13 May, the Vice President of Nepal hosted an event at his offices in Kathmandu to launch a report by IIED and AEMS entitle “Safeguarding the future, securing Shangri-La. The launch was attended by an array of media: TV, radio, print journalists as well as dignatories and environmental researchers and activitists. The report, produced by leading Nepali thinkers, synthesises the outcomes of the Pokhara Learning Group workshop (see above).It explores efforts over the past twenty years to mainstreaming the environment in planning and decision-making, and presents case studies which can act as springboards for further action. It also examines the drivers and challenges to such mainstreaming and makes recommendations for further action. The evidence presented makes a compelling case for change and investing in the environment. A key recommendation in the report is that the government, academics, NGOs and others should engage far more actively with the media and performing arts to promote environmental awareness and good stewardship. Evidence in Nepal, as in most countries, shows that one of the key challenges to environmental mainstreaming and causes for continuing environmental damage is the continuing widespread lack of understand of the importance of the environment in underpinning the economy and its key role in maintaining a range of services and supporting livelihoods. This is particularly so in poor countries that are highly dependant on their natural resource base. Whilst ‘dry’ technical reports, produced by experts, are vital for synthesis and presenting analysis and facts, they are not read by leaders and ordinary people, and even where they are, they are not inspirational. It is necessary to seek other ways to communicate to the masses to raise environmental awareness and encourage changed behaviour. 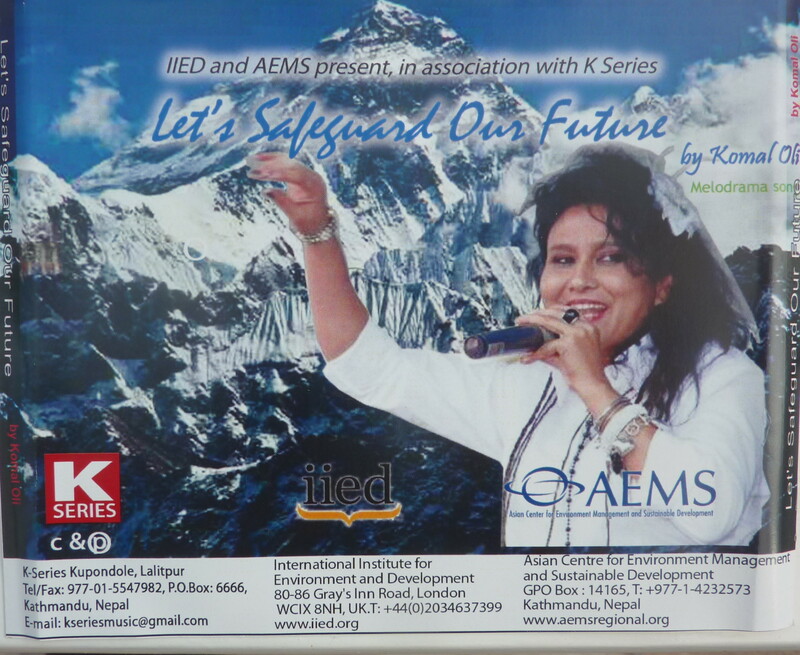 As Nepal’s leading folk singer, Komal Oli, has put it, “Song is a very powerful medium for everyone. We all listen to and are influenced by music. If you say to people “do this or don’t do that”, most likely they will be irritated and do nothing. But through music you can change people’s attitude, thinking and behaviour”. Land of the legendary Gorkhas.